The button responds to hover, but clicking it does not save the beverage or load a new page. 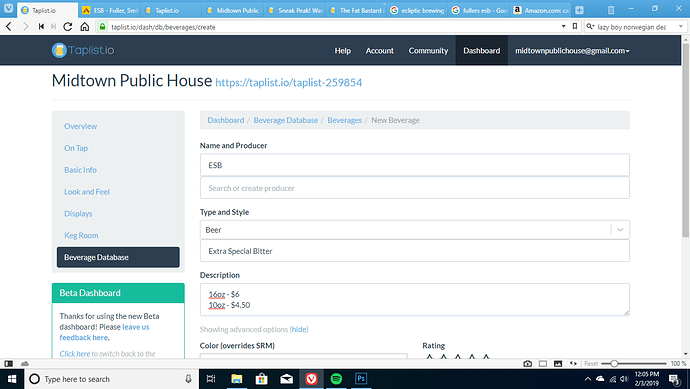 Also worth noting that I recreated the setup, but with a different beer in order to take the screenshot, and this time the button did work. The only difference was that I was force creating a new producer when I generated the issue the first time, and this time I was selecting an existing producer. Perhaps that is relevant, but it seems to have been random in the past. I just checked, and force creating a new producer did not seem to trigger the issue. Got it! I think I know where the issue is, thanks for all the details. Ok, this bug should be zapped. In addition, I fixed a bug with the error reporter that was preventing this error from auto-reporting. Ahhhhhh! Now I get it! I assumed that all of the displays were just browser windows so I didn’t fully understand why they needed to be “registered” as displays. Everything seems to work perfectly now. Thanks Mikey!! the new UI is also still missing the option to add images. I keep intending to test the new version but I have to use the old version to get my stuff entered correctly. Still love the improvements though! As midtown pointed out, the ability to add / remove a tap image and beverage image is gone. What’s the plan in this regard? I found the previous image logic rather confusing in terms of which image “trumped” which other image. Maybe you’re planning to simplify this? As midtown pointed out, the ability to add / remove a tap image and beverage image is gone. What’s the plan in this regard? Temporary regression - will be restored soon. I found the previous image logic rather confusing in terms of which image “trumped” which other image. Maybe you’re planning to simplify this? I’ve found it confusing, too! Probably explains why I’ve unintentionally broken it a few times when trying to simplify it. More to come here. Modest update today: Look-and-Feel settings will now automatically adjust to the capabilities of the theme. For example, if you’re still using one of the legacy/deprecated “Griddy” themes, you will only see options that the theme supports. And if the theme does not support Portrait mode, the layout option will be disabled. Today this is primarily of historical concern, as most folks are using the flexible and featureful Dense and Jumbo themes – however it paves the way to more easily supporting addition themes. As usual, let me know if you see anything broken. You’re probably picking up on a pattern, Beverage Name / Brewer / Beverage Style 1, Beverage Name / Brewer / Beverage Style 2, Beverage Name / Brewer / Beverage Style 3, … and so on. The Beverage Name, Brewer and Beverage Style are correct corresponding to the first Beverage displayed (doesn’t matter which Beverage you display first). However, in displaying subsequent Beverages, only the Beverage Name is updated. The Brewer and Beverage Style reflect the previously displayed Beverage. 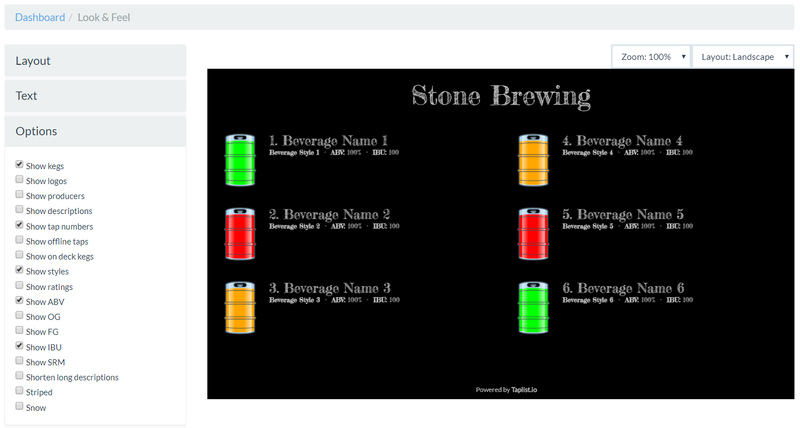 In the screens (above), the Beverage Name, Brewer and Beverage Style for Beverage 1 are correct. However, for Beverage 2, the Brewer and Beverage Style corresponding to Beverage 1 are displayed. For Beverage 3, the Brewer and Beverage Style corresponding to Beverage 2 are displayed. And so on. Modest update today : Look-and-Feel settings will now automatically adjust to the capabilities of the theme. Griddy 2.0 displays ABV, SRM, IBU, OG and FG, yet no Options to enable / disable these fields. I’m not sure “Striped” is applicable in that Griddy 2.0 is striped by definition, correct? 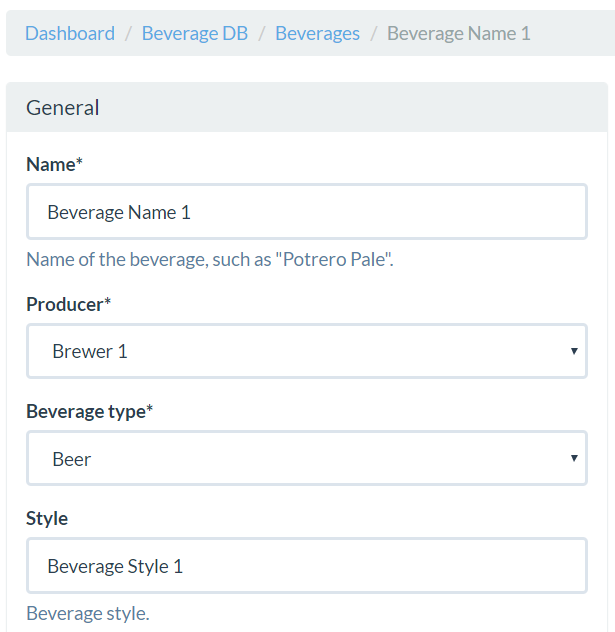 I’d really like to see a “Dense 2.0” built-in theme that supports 12 taps per page with “Show kegs” set. The keg image is simply too big with the existing “Dense” built-in theme. With “Show kegs” set, the “Dense” built-in theme is no longer dense. Actually, it’s rather “Sparse”. You only get 6 taps per page. This can be a stop-gap until which time as we can Build, Customize and Share Themes. Thanks for the eyeball, Joe! The Beverage Name, Brewer and Beverage Style are correct corresponding to the first Beverage displayed (doesn’t matter which Beverage you display first). However, in displaying subsequent Beverages, only the Beverage Name is updated. Yikes, great catch! Nasty bug - the fix should be out now, thanks for all the detail. Griddy never had the option to turn these on/off; they just appear when the values are present. So this is, for better or worse, the right way. Hear you loud and clear - tho, we should let’s keep this thread on the topic of bugs and dashboard features. “Look and Feel” appears to be disabled on the Beta dashboard. I ran into this yesterday. I thought Mikey might be working on it. It’s still unresponsive this morning. Graphically, “Look and Feel” appears correct. However, the various menu options (Layout, Text, …) are non-responsive. I can’t make selections in drop-down menus. I can’t enter text. I can’t select / deselect check boxes. When I pull this up my look and feel screen is just blinking very fast. Granted I am brand new to this so maybe it is something I am doing wrong. However, it worked fine in the old version. By chance, are you experiencing that on a mobile (what browser)? I think there are some issues with the look & feel page on mobile devices. Yes. Mobile device with safari browser. For what it’s worth, I experience the same thing with my iPhone / Safari. If I refresh the dashboard enough times, it eventually goes away. Of course, if you refresh the dashboard yet again, it’s likely to return. I don’t administer Taplist.io using my iPhone, so it’s not a major concern … although it may be nice to have in a pinch. So, if you set a producer logo it automatically shows up on all bevs by that producer. If a specific beverage has an image, this overrides the producer which is handy if a release has custom art for example. Lastly, you can set an image for the keg which will override the other two. This might be a redundant feature, but this is how the hierarchy should go. The more granular your feature, the higher the priority it takes. I only ever use producer and beverage logos though, so if keg logos are not behaving this way, that would explain confusion. 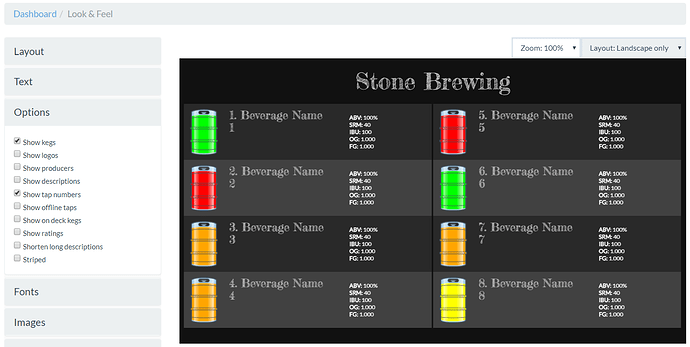 After deleting kegs, beers and producers the images are still left behind that have been uploaded for those kegs, beers and producers. 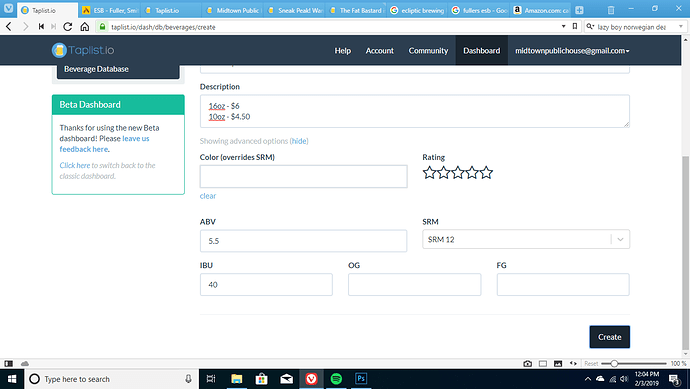 For example after deleting if I go to the new look and feel page and then chose images, add header image, the images for the deleted kegs, beers and producers are showing as available to use. Not sure if this is a beta issue or an overall issue but when deleting kegs, beers and producers the images should also be deleted.